Before I start on my project if anyone is going to the NEC on Sunday and would like to say hello, just leave me a message below. It would be great to meet fellow crafters in person. This week at MAWTT it is my turn to host the challenege and I have chosen the theme 'Precious Metals'. I would like to see any project that includes a precious metal and the best-known precious metals are the coinage metals gold and silver and another is platinum. I have chosen silver as the precious metal for my project, which is a page from a memories book I am making. When finished it will be for the wedding Ken and I are going to in Cyprus so that Richard and Sal can record the occasion. When I asked Sal what colour she would like she chose hot pink. 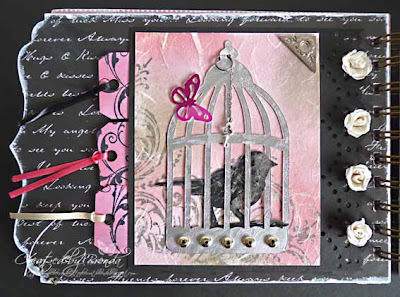 This page has the TH bird and cage made in embossed silver card and I covered the bird with black acrylic paint and rubbed some of it off so that it showed up more. As you can see my colour palette includes pink, silver, black, grey and white. Tucked in behind the the bird cage mount are three tags on which wedding guests will write a short message and I will include some photo and journalling mats for Sal to complete later. Additional silver includes the corner mount, silver beads at the bottom of the cage and a silver chain and small silver key. This week Merley Impressions are sponsoring the challenge and are giving away this fabulous prize for the winner. So I hope I will see you joining in my precious metals challenge this week so I can come on over and leave you some love. This is absolutely stunning Brenda and a gorgeous combination of colours. The happy couple are sure to love your book. Your project is absolutely smashing Brenda. I'm not going to NEC as I'm off to Florida Tuesday and the Scrapbook and Stamp Expo on April 8th/9th!! Have a wonderful time - look forward to seeing your purchases. I hope you will run in to some crafters - I know quite a few from craftbubble are going . . . This is just gorgeous hun! Love the bird cage it looks fab!! Thanks for sharing with us at Gingerloft this week, good luck! Hope to see you in Hunstanton this summer for a trip down memory lane! How cute is this. I love how you have the little tags at the left side. Just perfect for the Stampin' Sisters in Christ challenge. Thanks for playing along this week! Have a blessed day! Gorgeous! Love that cage! Thanks for joining us at Truly Scrumptious. This is absolutely beautiful! What a wonderful project. Thank you so much for joining us this week at Stampin Sisters in Christ! Wonderful card and love the birdcage die cut! Thanks for joining us at Secret crafter Saturday this week and good luck! Oh my goodness this is so fabulous!!! I absolutely love this... love the paint and rubbed off effect on the bird... love the silver frame... and I LOVE the tags for personalized notes!!! This is just perfect for our Stampin Sisters in Christ Challenge! Thanks so much for playing along!